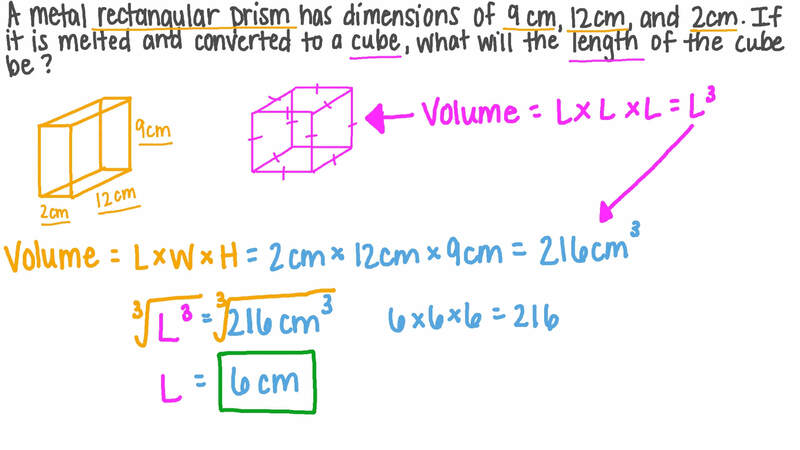 In this lesson, we will learn how to find surface areas and volumes of right prisms. A rectangular tank is 90 cm wide and 100 cm long. It can hold up to 810 litres of water when full. If it is filled to one-third of its height, determine the height of the water in centimetres. A rectangular prism has a surface area of 382 square inches, a height of 7 inches, and a width of 5 inches. Determine its volume. Find, to the nearest tenth, the surface area of a right hexagonal prism if its height is 14 centimetres and each of its base edges is 9 centimetres. A metal cuboid has dimensions of 9 cm, 12 cm, and 2 cm. If it is melted and converted to a cube, how long will one edge of the cube be? A silver cube has length 18 cm. It is going to be melted and converted into cuboids with dimensions 3 cm, 2 cm, and 12 cm. How many cuboids will this make? A silver cube with length 36 cm is melted and poured into a cuboid-shaped mold whose base measures 36 cm by 18 cm. What is the height of the new silver cuboid? A solid metal cuboid whose dimensions are 2 𝑥 cm, 6 𝑥 cm, and 1 0 𝑥 cm, was melted and made into small cubes. If the edges of the small cubes are 2 𝑥 cm, how many can be made from the melted cuboid? Two containers are full of mango juice. The first is a cuboid with inner dimensions of 35 cm, 33 cm, and 35 cm. The second is a cube with an internal edge length of 30 cm. All of the juice needs to be poured into bottles which have a volume of 775 cm3. How many bottles are required? A company is packaging its products into cubic boxes to be shipped. Each cubic box has a side length of 5 1 4 in. These smaller boxes are then packed into larger boxes with dimensions of 2 1 × 1 0 . 5 × 5 1 4 i n i n i n . How many cubic boxes can be packed into a larger box for shipping? A cubic container with an edge length of 24 cm was full of water which was then poured into a second container. If the new container is a cuboid with base dimensions of 24 cm and 16 cm, what is the height of the water in it? A cube has an edge length of 29 cm, and a cuboid has dimensions 45 cm, 26 cm, and 32 cm. Which has the larger volume? A cube has an edge length of 15 cm, and a cuboid has dimensions of 19 cm, 15 cm, and 21 cm. What is the difference between their volumes? A right circular cone is placed inside this cube such that the vertex of the cone is at the center of the base 𝐴 ′ 𝐵 ′ 𝐶 ′ 𝐷 ′ and the base of the cone touches each of the edges of the face 𝐴 𝐵 𝐶 𝐷 . Find, in terms of 𝜋 , the ratio between the volume of the cone and the volume of the cube.